When I was in college, my favorite hangout was the basement of the Harvard Book Store, where they had the used books and cheap remainders (they were also across the street from my freshman dorm, Wigglesworth, and yes, that is a most excellent name). I worked my way through several sci-fi and fantasy series, and got nearly all my Women’s Studies books, because of that one lovely room. One night in my freshman year I was browsing the philosophy section with a new boyfriend, a person with whom I often felt inferior and less-educated. I saw an author name on the spine of an old hardcover and, hoping to impress the boyfriend, pointed it out. “Hobbes Machiavelli, I’ve read stuff by him,” I said. I arched my eyebrows with what I hoped was an air of intelligence. The boyfriend, and a nearby witness, both turned towards me. “Hobbes and Machiavelli are two different people,” he said slowly. As a blush crept up my face, I realized several things: the excerpt of “The Prince” I had barely skimmed in high school was by Niccolo Machiavelli, Hobbes was a totally different dude, and my boyfriend thought I was a posturing idiot. It’s a good idea to know what you’re talking about before opening your mouth. These days, if I don’t know the answer to something, I don’t try to fake it. Recently, a Twitter follower suggested I write on this New Scientist story and the empirical article upon which it was reporting on brain activity, hormones and Premenstrual Dysphoric Disorder. As I am not an expert on issues of the brain, rather than try to be I enlisted brilliant neuroscientist Scicurious to do tag-team blog posts where we could each cover the material where we had expertise. I had a few thoughts about the way the New Scientist article author framed the study, and about the hormone analyses. So I’ll talk about that, and Sci will cover BRAINZ in this post. Rapkin et al (2011) seek to understand why a minority of women experience Premenstrual Dysphoric Disorder (PMDD), a suite of premenstrual behaviors that include severe and debilitating irritability, depression and anxiety. They used PET scans to look at brain stuff (cue Scicurious) and also looked at hormone concentrations to see if the reproductive hormones that decline in the premenstrual phase had anything to do with it. They found no difference in hormone concentrations between control and PMDD women, but did find variation in cerebellar activity by menstrual phase. You need to read Scicurious's take on this, because she provides important background and context to the study of the cerebellum for mood. The New Scientist piece makes a lot of the potential effect of progesterone on GABA receptors in the brain, but as far as I can tell the article itself does not measure GABA receptors. Progesterone, allopregnanolone and GABA are all interrelated and important chemicals when it comes to mood (Concas et al 1998), but like I said, since the study didn’t actually look at GABA, I’m not going there. Sci has also made some important points about this issue, and on what the study authors found (which is admittedly cool) with what they discuss around GABA (which might be a wee bit of a stretch). “Is it that time of the month? These are the words no man should ever utter. How about this for a diplomatic alternative: "Are your GABA receptors playing up?" You may be spot on. It seems that these brain cells are to blame for some women's monthly mood swings. There are a few things that trouble me about this. First, without citing any actual incidence of this symptom, the author claims that many women suffer from irritability before their period. This just perpetuates the idea that irritability is a common premenstrual trait, when the premenstrual phase is an incredibly variable period. This is despite the fact that at most only eight percent of women actually get these symptoms to the point that they are debilitating (the two studies the study authors cite give a 5% and 8% incidence, so 8% may be high). From a public health or science research perspective, eight percent of reproductively aged women is a pretty significant quantity. I absolutely want more research to be done on PMDD and, full disclosure, I’m running some pilot studies to work on it in the future myself. However, these results don’t necessarily translate to women who may just get a little irritable or experience other mild behavioral symptoms before their period. And that is why both the title and the “Is it that time of the month” joke at the start of the story were misleading. Besides its obvious sexism, where any female behavior that deviates from the pleasing and passive risks eliciting that question, the link here in the mind of a popular reader is that women’s behavior is governed by hormone and brain interactions more generally than the paper actually implies. So, to reiterate: PMDD impacts maybe eight percent of reproductively aged women (notice that I keep specifically referencing “reproductively-aged women,” which further shrinks the pool of women down to those between menarche and menopause). This is nothing to sneeze at. But this isn’t everyone. 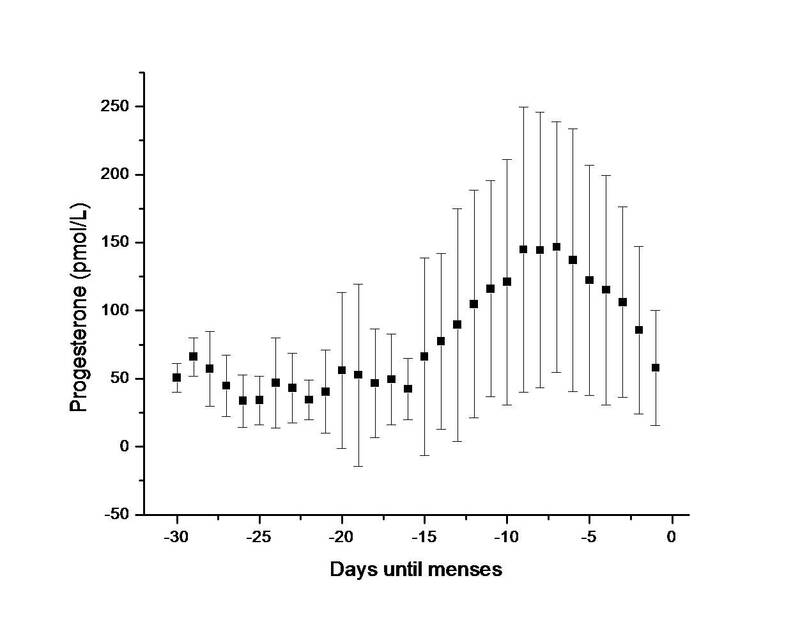 In order to see if there were differences in hormone concentrations between normal and PMDD women, Rapkin et al (2011) took blood on the days of the PET scans: this translated into one follicular phase (first half of the cycle, between menses and ovulation) and one late luteal phase collection (the week or so before the next menses). They found no difference in the mean concentrations of estradiol and progesterone between the two groups, at either time period. Table 1 from Rapkin et al (2011). None of these differences between groups are significant according to the authors, but they didn't report p-values anywhere I could find. There are several problems with this. First, the sample size is tiny. I have certainly been known to run analyses with fewer subjects, but the way I and other folks who do hormone work get around this is to sample each individual many more times. When collecting hormone information on reproductively-aged women, for instance, you want to collect a minimum of one menstrual cycle’s worth of data… every single day. My advisor raised me right, and so I did a power analysis of the data the study authors provided. A power analysis is a way to determine the statistical power of a test. You can do it beforehand to determine an appropriate sample size for your experiment, or afterwards if you didn’t find something statistically significant and don’t know if your analysis was effective. When there are small but important differences between two groups, but the sample size is also small, your statistical test can be insignificant and thus miss that important difference. 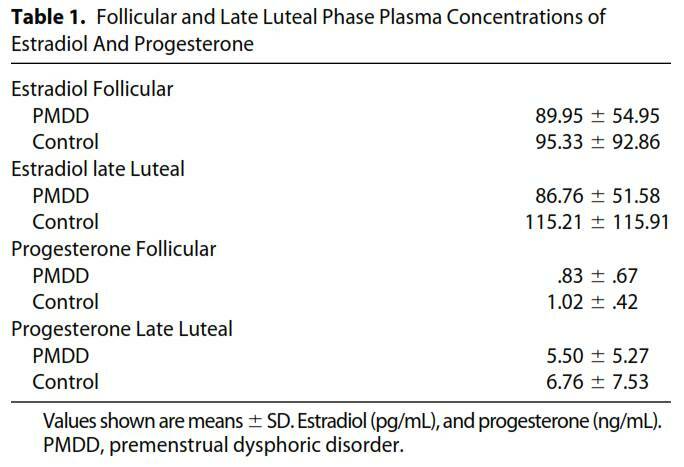 Let’s take the hormone and time period that should be the most meaningful: progesterone in the late luteal phase. 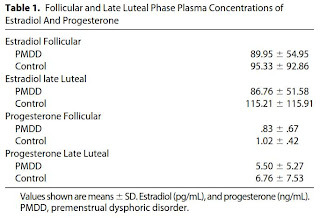 PMDD women had 5.50 ± 5.27 ng/mL, and control women had 6.76 ± 7.53 ng/mL. If we say that the smallest difference between these two groups that would be interesting is around 6 ng/mL (just splitting the difference between the two standard deviations, but this is pretty generous), then according to my calculations this test only has a power of about 60%. Therefore, 40% of the time a test with a sample size this small wouldn’t catch a potentially important difference between the groups. To put it into more perspective, the standard is to have a power of at least 80%. On Fertile Ground, by Peter T. Ellison. Go to the Amazon page to embiggen the image and you'll see the plastic tube one of the women is holding to collect spit. Most people with a clinical background or doing a more clinical collaboration seem to be needle-happy. That is, when they want to measure hormones, they take it out of your arm rather than from the many other places you can get it: blood spots (using a little lancet on your finger), saliva, urine, and feces. This will some day be a blog post in its own right. Here is the short answer: saliva is very often better than venous blood. Hormones are secreted from their organs in a pulsatile way, meaning they are released in short bursts, which leads to measurements going up and down quickly. Since they circulate in the blood, serum measurements of hormones are likely to pick up this noise. This is yet another reason why only two samples for each of the twenty four subjects is troubling. There are other reasons, related to what version of the hormone you are measuring when getting it from blood, spit or elsewhere, the higher compliance and greater frequency of sampling you can do with saliva, and the fact that you don’t have to stick your subjects or increase their risk of infection. 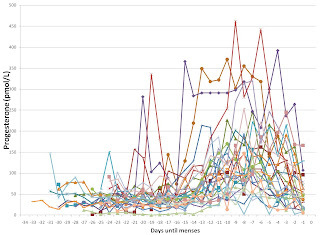 The only studies looking at variation in hormones across the cycle in menstrually-related mood disorders use blood (Bloch et al 1998, Rubinow et al 1988). 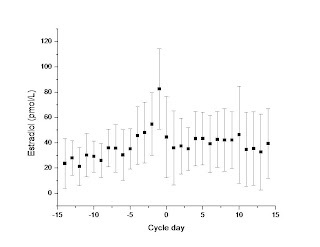 The Bloch et al 1998 measures 10 women with PMS and 10 controls using serum every day for a cycle (hooray, every day!) but they measure testosterone, cortisol, and other hormones not comparable to this study. Plus, they are looking at women with PMS, not PMDD, which is a much more broadly-defined syndrome. It would be harder to find a difference between these two groups than controls and women with PMDD. The Rubinow et al 1988 is old enough that I can’t get it online, the abstract says nothing about how frequently the hormones are measured or the number of women in the study, and I don’t know how strictly they define menstrual disorders (again, as opposed to the rather strictly-defined PMDD). My last issue with the hormones is with the two windows during which they measured them. 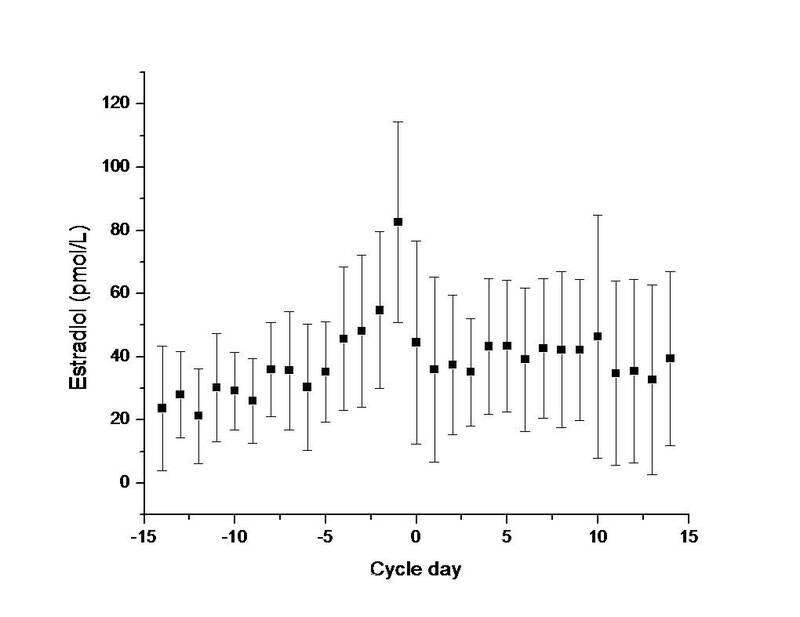 Women were measured in their follicular phase anywhere from 8-12 days into their cycle for the first measurement; then the late luteal phase measurement was 10-14 days after a measured LH surge (which occurs around midcycle). 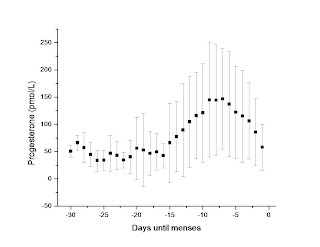 Here is the kind of variation I see when I measure women’s hormone concentrations every day. 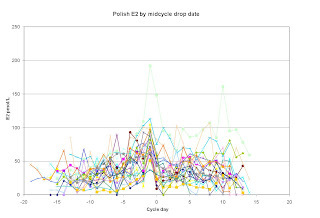 What you’re looking at is salivary estradiol (pmol/L) measured daily in over twenty Polish women, aligned by midcycle drop date. The first graph is all the women together, the second is the average and standard deviation. 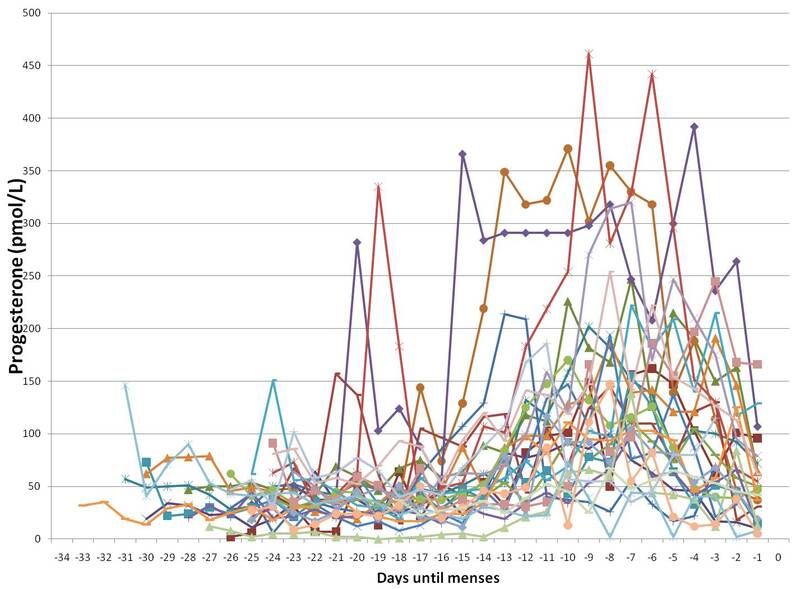 Individual Polish women's estradiol concentrations. Average Polish women's estradiol concentrations. Here is salivary progesterone from the same population, aligned by the end of the cycle. Again, the first graph is everyone individually, the second is average and standard deviation. Individual Polish women's progesterone concentrations. Average Polish women's progesterone concentrations. A few important things to note: this isn’t the same way the study authors aligned their data (though the way I have shown it here is more physiologically meaningful) and the units are different. However, if you look at about the times when the study authors were taking their measurements – mid to late follicular phase and late luteal phase – you see a TON of variation between those days, both within and between women. This is why a single measurement in that general window is, in essence, of no use. You have way too much noise in a single measurement to be able to begin to say anything about differences between groups. PMDD is very likely related to hormone concentrations – if not in their average values between groups, then in how those hormones differentially impact brain functioning (the brain sensitivity stuff Sci discusses so well). But we won’t know these potential differences if we don’t gather the hormone data correctly. Just because brain scans are cool -- and really, they are and I applaud the study authors for doing stuff that I simply cannot do and finding interesting results -- doesn’t mean you can give the hormones the short shrift. Ha, thanks! I think our tag-team approach worked out really well and am so pleased to have gotten to do this with Sci. I would love to see more coordinated efforts by other bloggers, and to do this again. It was a wonderful experience. OM NOM NOM, yer BRIANZ. I also had a lot of fun with this, and I thought it was great how we both picked out different parts of the paper to focus on, and brought different comments and expertise to the article, creating two entirely different posts and sets of criticisms. Seconding Ed - I loved this! Whatever "this" is called, it should happen more often. Both posts were great. I loved how you got into the sexism "where any female behavior that deviates from the pleasing and passive risks eliciting THAT question" and the 8% incidence rate. To write about a disease that is debilitating by definition, and start off with a teasing joke is pretty rough. Also, I don't get offended when people say "is it that time of the month?" because hardly anyone ACTUALLY says that, and when they do, it's true. I don't get offended because my mind is sensitive to annoying people sometimes. I liked that the posts emphasized that PMDD does not effect all women, and that there is a lot of variation between women in how they are effected by things like hormonal changes around the time of their menstraul cycle. I feel that society as a whole tends to generalize women's behavior during "that time of the month," and write's off bad mood's as "just that time of the month." I feel that the general populations understanding of women's biology and reproductive cycles is lacking and everyone would benefit from more studies on how hormone shifts can effect women of reproductive age. Being a student and reading this it really brings to light, even just some of, the issues that can come about in this sort of research. It is nice to start an internal list of "no no"s when it comes to writing for scientific research. I also wanted to say that I agree with Courtney's comment above. I think it absolutely needs to be brought to the general public's attention that not all women become extremely moody once a month. And I also appreciate that Professor Clancy made an adamant point that the "reproductively-aged women" are only a small faction of the entire female population. One thing that I was curious about while reading this review was the distinct differences between PMS and PMDD. I think that a lot of women are confused about this and it is something that would be beneficial to have a better understanding of. I like that this post clearly shows how important it is to really critically look at data to understand just how reliable it is and what types of conclusions can really be made. 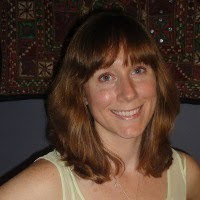 I agree with Anna that it would be very beneficial to have an understanding of the differences between PMS and PMDD. PMS is a very overused term. Men can blame a woman's mood on it, as opposed to considering that she has a legitimate reason for being upset (or that she's not even moody at all). On the other end of the spectrum, I had a friend in high school who completely took advantage of what she perceived as an excuse to be moody and was just a complete nightmare to be around for one week a month. However, if there is a medical condition that actually affects certain women (albeit, a small percentage), then they deserve more info about it. I find it extremely cool how you tag-team approached this issue. This way you have two brilliant minds working on one issue instead of just one. I was very intrigued to read all of the insight into PMDD. I personally suffer from it and treat it by taking Zoloft regularly. This post has made me wonder whether or not my Zoloft is as effective in treating my symptoms as I previously had thought, especially if there might be a stronger link to my body's hormones than simply just my serotonin reuptake. I also admire your ability to see through all of the cracks in pieces of research in order to obtain a better perspective on the data. I personally hope to strengthen my own personal ability to do so.